Sport Court has designed professional quality in-ground basketball systems that ensure the best in performance and safety. 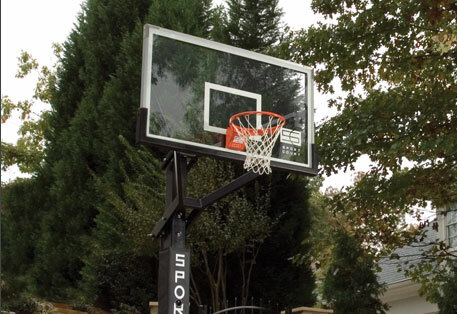 Our SlamSystems feature wide-based arena view arms for maximum stability and torque resistance, with superior corrosion protection, and an advanced height adjustment system for easy use by players of all ages. 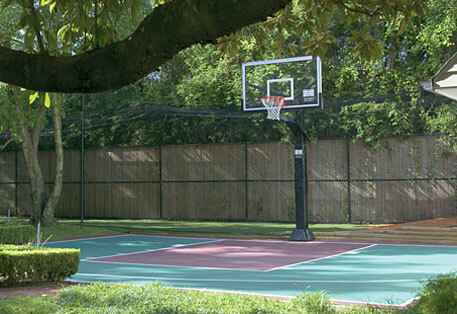 Tempered glass backboards deliver pro-level ball rebound, and included backboard and pole pads provide increased safety. Our Pro line of basketball systems incorporates the highest-quality manufacturing standards with the best features in the industry. The secure in-ground anchor system and 6" powder-coated steel pole creates a stable foundation that cuts down on vibration and torque, and the 72" tempered-glass backboard delivers superior ball response and feel. Extension arms are available in both 36" and 48" lengths. In addition, we’ve added pole and backboard edge pads, a sturdy and reliable height adjustment mechanism, and a stop bar to be sure that even younger children can safely raise and lower the basket to their heart’s content. Our Collegiate line provides the same quality construction, tempered glass backboard, and ease of operation as the Pro, but with a slightly smaller configuration. The backboard measures 60" across, with a solid 5" pole, and a 36" overhang, giving you the features you desire at a lower price.